o A security deposit of $250.00 is also required and will be credited back within 14 days of checkout based on the condition of the condo. · Cancellations made more than 60 days prior to the check-in date can have the deposit applied to a stay at the same AlohaCondos.com property within one year of the original check-in date. · Cancellations made less than 60 days prior to the check-in date will forfeit all deposits. · Cancellations made less than 30 days prior to the check-in date will forfeit all deposits and rental balance due payments. · All stays have a check-out cleaning fee of $135.00. · Stays of more than 10 days have additional mandatory interim-cleaning fees of $135.00 every 10 days. For example, if you had reserved the condo for 28 days, there would be 2 interim cleanings during your stay - one on the 10th day and one on the 20th day - as well as the one-time cleaning after you check-out. · Check-In Time is at 3:00 PM. · Checkout Time is at 11:00 AM. o Exceptions can be made if arranged in advance with the owner. · This is a non-smoking unit. If you need to smoke, please do so outside of the condo. · We allow a maximum of four overnight guests in the unit. · We charge a replacement fee of $80.00 for the missing modem. This place was perfect for us. We had our own well equipped kitchen and our own balcony overlooking the water. The only downside was that our flight didn't leave until 10:00 p.m. and we had to be out of the room by 11:00 a.m. We had to stay by the pool for the day with our luggage poolside as well. Front desk didn't seem to be very accommodating. You couldn't have made a better decision on your Island getaway accommodations than this invitingly clean and recently refurbished open-planned condominium unit - upgraded with your comfort in mind in the very heart of town...with spectacular ocean and sunset views. The crisp, recently refurbished living room area is a relaxing haven to getaway to with your beloved, family or friends. The well appointed fixtures promise comfy days and nights of lazy abandon in a truly vacation atmosphere on the island. A tropical wicker chair, bonus pull-out sofa, television and a dvd player....all these set against the backdrop of the waterscape that only Hawaii can boast! This fully upgraded eat-in kitchen has granite countertops, stainless steel sink, black-on-black drop-in range with radiant countertop, the indispensable microwave and a refrigerator to stow away necessary vacation staples...what more could an Island Chef want?! Cookware, silverware, tableware and glassware? Banish your worries...they are conveniently provided for your entertaining needs. Get ready to abandon yourself to the pleasure of a pampered sleep after a day of exploration on the island. A ridiculously comfortable queen bed invites all your pleasant dreams. Laundry-fresh linen will envelope you in comfort throughout. Your day starts and ends with the majestic view of the azure ocean in the horizon! Wash away the tiredness from a day out in no less than a pristine and consolingly clean and recently refurbished bathroom: new tiled shower and floors -- warmly hued in colors of the earth. Every inch a part of the island experience! By the way, we have clean, fresh towels already -- hooray! -- less to pack and more space for your island souvenirs in your luggage! We stayed in Condo 1512 for the 2nd time and love the suite. The view from the lanai is wonderful and you have a great view for the Friday night fireworks. The kitchen is well stocked with equipment and you can cook a gourmet meal if staying in. The bed is huge and super comfortable. There were only one issue this year as compared to last. This year the new wifi system was a bit spotty. Room 1512 kept bouncing out and picking up another room. The internet company did fix it and it was ok for awhile, but we would have to unplug the box each morning to reset. We will, however definitely come back for another visit. Lovely condo with spectacular view, perfect for two. Eleanor’s condo is tastefully decorated and well situated being near the elevators, laundry room, and bather’s elevator. There’s just a small amount of wear-and-tear, but it didn’t detract from our enjoyment. At first, I felt there wasn’t enough clothing-storage space (no chest of drawers), but there were just enough hangers and plenty of space in the closet, and a shelf, too, so all our clothing fit. The lanai lounger was a favourite spot to enjoy the view and fireworks. There is an excellent array of beach gear in the box on the lanai, as well as coolers in the hall closet to borrow; ice packs, too, in the freezer. Eleanor was quick to respond to correspondence, and a pleasure to work with. We would certainly rent from her again. We’ve stayed at this apartment several times and it never disappoints. Beautifully located, convenient to everything that Waikiki has to offer including beach, shops and lovely walks. This is a very nice and well taken care of condo. It had everything we needed to be comfortable and enjoy our stay. The location is perfect, we could hang out at the beach just footsteps away, watch the luau on the rooftop of the Hilton, and walk to many restaurants and shops. I have stayed at the ilikai before and this is one of the best condos I have stayed in. Thank you for sharing your condo with us. Hope to be back soon. We stayed 5 nights and were very happy with our choice of condos! Making the reservation was easy and the instructions to get in the condo were detailed. The view from the balcony was amazing. the kitchen was adequately stocked and the unit was clean. We parked our car around the corner at the Marina for $ 23/night with in/out privileges; which we thought was a reasonable rate for the city. There are many restaurants within walking distance and we appreciated being a bit away from the crowded area of Waikiki. The condo met our expectations. If you're looking to not spend too much money on a room for a family of four in the bustling Waikiki area, this is the place to be. Of course Hilton across the street is newer and probably has better AC, but it is at least $150 more per night. It was well equipped and my 14 year old son thought the blow up bed was fine. The condo overall, needs an update, but then the price to stay there would go up too. The views of the beach were excellent as well as the views of the nightly luau show at the Hilton next door. Elevators were fast and valet service was pretty good. Thank you for posting a review in response to our request. We are glad the condo met your expectations and you agree that it is a reasonably priced unit with amazing views. You are right where you want to be and close to everything! You are correct in that an update would then take away the good pricing which allows more options for guests. However this unit has had some upgrades from the original build in that along the way, the bathrooms and kitchen were improved nicely and flooring. The owners have replaced the mattress just one year ago and the sofa is only 3 years old. The AC was also repalced just one year ago. The owner has given the condo more of a traditional style and they love it! It would be hard to find a place with those great views at the great rate! Thank you again for your review as we do appreciate it much. Aloha. and congrats on finding Aloha Condo's and Ilikai #1512. Read all the reviews. I can't think of anything specific to add. Everything you need to know is in these reviews. pictures and webpages. This place is fantastic, and so is the service / ease of booking from the owner, etc. What more could you be looking for, particularly at this price point? Great room. Superior View. Fantastic Location. Fully stocked Kitchen. Air Conditioning. We only got to spend our final two nights of a 3 week vacation in Mrs. Santo's unit. She graciously allowed us a 2 night stay, where the stated rules do require a minimum of 3. When we Island Hop we always fly in and out from HNL. On our next trip we will extend our stay in Waikiki, and try to get back into #1512. We lucked out and got two fireworks shows, for both Friday and Saturday night. Saturday was a wedding or something. The photo's don't lie. You are that close tothe Lagoon. Full convenience store in the Hotel lobby meant Mai Tai's on the Lanai. We will be back. My favorite review of this unit was posted way back in 2010, which summed it up nicely, so I will re-tweet. "Telling everyone about condo unit 1512 is like telling everybody about your favorite fishing spot - something you'd rather keep a secret but it's too good not to spread the word!" This condo had everything we needed for a perfect stay in Oahu. Great location, beautiful view, friendly staff, and well furnished. Eleanor is a joy to work with. Very responsive and helpful. We really enjoyed seeing the fireworks and luau from the balcony. The bed slept great as well. Thank you, Eleanor, for a wonderful time in your beautiful condo. We have stayed at Aloha Condos several times now and keep going back. The condos are well situated with everything at your fingertips. Restaurants, shops, local amenities – it’s all there. The condos themselves are lovely and perfect for a family getaway. If you want to eat in, the kitchen is well equipped. We would definitely recommend Aloha Condos to anyone looking at a holiday in Oahu. This is the second time we have stayed in this condo and it never disappoints. Clean and well layed out it was a comfortable stay for 3 of us. Close to the beach, Waikiki and alamoana shops the location was fantastic. Nice restaurant downstairs with shops as well for convenience. Bus stop directly at the front door making it easy to get around. 5 stars wee deserved from us. This is the second time staying in this condo, third in Ilikai Hotel and Condo. We, also, have stayed in Hilton Hawaiian Village Rainbow Tower, just next door. We just love the location. This condo was just as perfect as last time, clean, updated, best ocean-front and fireworks view, and had everything we needed. My only very small complaint is the sliding door was very hard to slide and lock. Hopefully, the next time we stay here, that would be fixed. I would recommend staying here and I hope to come back. Perfect condo, super comfy king size bed, my 13 yr old son was very comfortable on the pull out. The condo had everything we needed. Amazing views.. perfect location..great communication with owner. Easy check in. Highly recommend. I love where the Ilikai is located and the condo at 1512 is perfect. The view was spectacular, we even watched the luau every evening on the rooftop of the Hilton. I enjoyed the kitchen and moving wall for privacy. It was clean and comfortable. There were several beach items in a box outside which I added a nice heavy duty chair too. I will be staying here again on my next visit. Perfect location! Amazing view! I would definitely stay here again. Perfect view from the balcony of the Friday fireworks. This place had everything we needed for fun in the sun, beach towels, chairs, snorkel gears, boards, etc. We'll be back!!! The condo exceeded our expectations. The condo was clean, comfortable, centrally locatedand had awesome views. Instructions were well outlined and simple to follow. We would definitely stay there again should our travels take us back to Oahu. The condo was nicely furnished and in a great location overlooking the lagoon and ocean next to the harbor. The condo itself was very nice, but a little tight with four people, two adults and two teenagers. One teenager slept on the air mattress and the other took the pull-out couch. They were comfy, but there was only bedding for one, so we split the sheets between the two. The queen mattress was a little worn and a little tight for my husband and me. Otherwise, we enjoyed our stay and it was especially nice to be able to use all the beach toys in the storage box on the balcony. We grabbed chairs and the boogie board and off we went. Mahalo! This condo provided our family of 4 with everything we needed for the perfect holiday in Hawaii. When we arrived, it was clean, airy and welcoming. Well equipped kitchen for those times when you want to eat in. We will be booking this condo again. For the week of June 21st our 30th anniversary, we recently stayed 5 nights in unit 1512. The view is awesome. The location is perfect for paddle boarding in the lagoon and swimming in crystal blue ocean. The beach supplies on the lanai were perfect as we could pack a soft pack cooler and beach towels and chill at the best beaches in Waikiki . Thanks for a memorable stay!!!! The condo was amazing, great view, awesome location, very comfortable with everything needed to enjoy a day at the beach! Found great happy hours super close, shuttle pick up right out front of the hotel. We will definitely stay again!! Couldn't of asked for a better condo to celebrate our 20th. Thank you Eleanor for making our stay wonderful!! This condo is the perfect location with the most amazing view from it's balcony. I loved getting up every morning and having my breakfast out there just watching all the activity down below. The condo had everything we needed for our 2 week stay, including boogie boards, deck chairs, beach towels and more, it really was very well equipped. We arrived a little earlier than check-in time but the room was already available, and it was nice to find a few necessities, ie toilet paper, shampoo, soap, washing detergent had been left for us. The only negative I have is that the bed is not the most comfortable, due to the way the slats are set up on the base it makes the mattress sag in the middle, hence we were always rolling into the middle of the bed!Overall, I loved this condo, it is ideal for a couple or a family with a small child, and I would definitely recommend it to my friends, plus keep it in my records for my next visit. We stayed in the Ilikai for five days with our children. The condo was rented through alohacondos.com. We were very pleased of our condo. There were plenty of storage and space to accommodate all of us. The view was beautiful! We did enjoy watching blue ocean water and the lagoon. The condo is clean and really well equipped with everything you would need in the kitchen, has all accessories for the beach. The lagoon and the beach are a five minutes walking distance. We plan to stay there again. Quiet, comfortable condo with an awesome view! Everything we needed was there. Elevators are speedy. Short walk to the beach. Being able to watch the Luau on the hotel roof next door and having a front row seat for the Friday night fireworks was also a nice perk. We had a wonderful week staying in 1512. The location is perfect to keep quite if you want or walk down the beach to the action. The unit is well appointed with everything you need even beach accessories. The view from the Lanai is fabulous, we spotted a whale one morning. We have stayed at Ilikai before on the other side and this unit by far is better. Communicating with Eleanor is easy and she responds quickly. A wonderful experience, thank you Eleanor!! Everything about this unit was perfect! It was my husband, myself, our 16 year old daughter, and our 4 year old son staying. The unit was idea for all ages. I based our choice of lodging based off of personal reviews so here is my detailed review to help you make your decision! The kitchen was fully stocked - not a single item we wished was there. We ate most all of our meals in the unit for 8 days with no problems (and there is a WalMart just over a mile away for inexpensive grocery shopping or a Foodland, which was reasonably priced). The lanai was amazing! It is the full length of the unit, which most other condo complexes don't have. That was a big selling point for us to stay here. We all four ate outside for each meal with plenty of room to enjoy the breathtaking views. We actually never utilized the bar stools inside because the lanai was perfect since it had two smaller tables, four chairs, and a lounge chair. I even stored our stroller out there while not in use and it was never in the way because there is so much room out there. Let's get to the best part of the lanai. The huge deck box out there is packed full of practical beach items. Not just your standard sand toys to occupy a younger child. In addition to those (which were conveniently in a beach bag to take to the beach easily), there were boogie boards, beach umbrellas, beach chairs, blow up pool toys, insulated coolers, sand mats, etc. We did not have to buy a single thing for outdoor entertainment since it was all there. HUGE PLUS for us! The view from the lanai is great. You can see the rooftop Hilton Hawaiian Village luau from the lanai - that saves a lot of money being able to watch it. There are also fireworks near the lagoon that can be watched from the lanai on the weekends. Great front row seats! The sliding doors between the bedroom and living room were nice to have some privacy while sleeping yet be able to open it up for more space during the day. The bed was comfortable and the air mattress in the room isn't just a little flimsy thing, it is a queen mattress that is very thick and cozy. There are plenty of extra sheets and blankets to create an ideal sleeping space on the mattress. There were many little touches throughout the unit that were very nice such as a stool under the bathroom sink for little ones to use or Aloha condos leaving behind a large beach bag to tote necessities to and from. There were plenty of towels to use and cleaning supplies were provided if you chose to tidy up throughout your stay. The pool was nice and easy to get to. There is a little store in the lobby as needed and an ABC store across the street along with restaurants and other shops. The building is on the quieter end of Waikiki so you are walking distance into the busier part yet can retreat back to the quieter end very easily. The lagoon was great and is available for public use. Ideal for younger kids since there are no waves. But if you want the actual ocean, it is right there as well. There is also a boardwalk for easy access to stroll the beach or a nice morning run. The unit location is ideal as well. It is right off the elevator and close to laundry. But there is no noise or noticeable foot traffic from either. You don't have a keycard for the room, just a code to lock the door. It was so nice not having to worry about taking a key card to the beach or the pool! As others have mentioned, parking can get pricy, but no different than it would be in any other metropolitan city. Any hotel/condo in Waikiki area charges parking and is in the same price range as the Ilikai building. It is up to $28 a day for the valet but considering we used our car to go explore on a daily basis, the convenience of this was very nice. They are prompt and professional. Plus, they bring you your car with the AC on so you are never getting into a super hot car. The secure location of the valet parking lot was nice as well since we had 6 hours after check out until we needed to leave for the airport and I had no worries loading up the car and giving it back to valet while we wandered town until it was time to leave again. You can look for free or cheaper parking nearby but we didn't think it was worth it for the added time and effort, especially realizing how convenient it was to load and unload right in front and continue on our way. I will certainly choose this exact unit again next time I am in Waikiki without even looking elsewhere. I do not have a single complaint. The owner was great to work with and is excellent with communication. I felt like I was in a home away from home. It was ideal! The quiet surroundings, the view from the lanai are what I look forward to that is why I have rented this condo for the past 5 years. The location close to all the services and shopping areas I enjoy and use on a regular basis certainly work well for me.Highly recommend the site. We want to thank you for taking the time to post your review. We also want to say a big “mahalo” for coming back now for 5 years! The location of this complex is perfect! It is convenient to everything you would need such as restaurants, shopping and beaches. The Marina and ocean views are exceptional and do bring a sense of calm to any day! We look forward to continuing to serve you in the future. We appreciate your business! Thank you for your review. We are glad you enjoyed your stay and found the unit to be something you would be happing in returning. We do not provide water but there ABC store pretty much on every corner and are open late and sometimes all night. The location of this unit does provide the convenience to everything and is right downtown. We hope you will allow us to accommodate you again in your next stay in paradise. Mahalo for your business! Beautiful view and great location. Downtown easily accessible walking or bus. Cannot beat the value in having a beachfront location and a full kitchen. Help easily accessible for any questions or concerns. Our stay at the Ilikai Hotel was pleasant. The hotel location, amenities, shops and restaurants were all good with very friendly and helpful staff. The particular condo we stayed in was just okay. The AC is placed right next to the bed and is quite loud which meant you couldn't use it at night as it would interrupt your sleep. And the condo was a little worse for wear. We had several friends staying in other condos because we were all there for a wedding...their rooms were much nicer as the owners of those suites have renovated their suites. I would stay at the Ilikai Hotel again, but would likely choose another suite. Really enjoyed this place. The view is stunning. Great convenient location. Well-appointed unit. Very comfy bed. Unit manager was very helpful and informative. Would definitely pick this one again! The location for me is great, across from laundry, around the corner from the elevator. The entire complex is well located for me, I love the area, close to the shopping mall, a lovely walk along the beach and the view is wonderful. I know the area well as this is my 8th year staying at the Ilikai and will always try to stay there. The available services there are wonderful, the staff there is great, friendly, courteous and very helpful. The cleaning staff for the condo were so helpful and friendly. Second stay in 1512, would be hard pressed to find a more accommodating owner and staff to deal with in Waikiki. From the ease of the reservation process to the simplicity of checking in to the unit, kick starts your "real vacation time" in fine style. Simply walk into property, find the elevator, and enter the unit within minutes of arrival. The furnishings and amenities within the unit as others have stated are in abundance, you will truly be hard pressed to not locate anything you might need within for cooking, relaxing and beach fun. The property location for me is perfect, just far enough away from the hustle and bustle (and noise) of the main part of Waikiki (yet easily walkable beach side or street side) Ala Moana Shopping Center minutes away on foot, beach about 3-4 minutes max on foot. 23 visits and counting to Honolulu, all stays have been at the Ilikai, so happy to have found this unit within this property for the last 2 years. The view from the large lanai you ask? Simply needs to be seen and experienced with your own 2 eyes to be truly appreciated. The ilikai hotel is beautiful. The personnel were very friendly and helpful. Condo 1512 was just perfect for our family. It was all that we expected-great location and all the amenities of a hotel. The view is stunning, with a free viewing of the luau show held at the Hilton. We will definitely return to this condo/hotel if ever in hi and I have already recommended it to friends. We thoroughly enjoyed our stay in unit 1512. We usually stay at the Ilikai Hotel and this was the first time we stayed in a condo unit. The unit was close to the laundry room and elevators which was convenient! It was nicely furnished and having the kitchen helped to make our stay more enjoyble. The condo realistically sleeps 3 persons comfortably (one full size bed and a sofa bed that lays flat for one person). There was an air mattress in the closet which we could've blown up and used, however we opted to borrow a futon mattress from my in-laws who live on the island. I'm not sure how comfortable the air mattress would've been. We all enjoyed this unit; this includes my husband and two sons ages 22 & 17. The ocean view was always a beautiful sight in the mornings, afternoons, and at sunset! We would definitely want to return. Thank you to Eleanor who was very attentive with our booking. We've stayed in the Ilikai a number of times so we knew what to expect and were very pleased with 1512. Eleanor was a pleasure to work with. The condo was just a pictured. Plenty of room. The Lanai was confortable and included a tub of beach equipment. Made it a point to get take-out from the Ilikai Bar and Grill and watch the Fireworks on Friday night from the Lanai. Perfect views for a fraction of the price that others pay across the way. Great location, you can walk to everywhere. If you want you can watch a nightly luau from the lanai as well. Again, very comfortable and we will definitely get in touch with Eleanor for our next trip! Mahalo!!! The Ilikai hotel and room 1512 are really hard to beat for a really nice vacation. The room is comfortable with all updated furnishings. And the view is just amazing. There are a couple of suggested improvement, but nothing that would stop us from renting there again. We reserved the Condo 1512 online and found the photos to be an accurate description. The view was fantastic and we got to watch the Luau show from the balcony on many nights. This is a very convenient location to the beach and shopping. The parking valet was expensive at $28 but we used the free and reduced rate parking at the marina most of the time. The condo was very clean and modern and good size for a couple, although an extra mattress was provided. All appliances worked well and the grocery store was not all that far away at ala Moana shopping ctre. The beach equipment box on the patio was great! Thanks for thinking of all those things! We hope to return soon! Mahalo! This lovely condo, with it's tasteful decor and ocean view, met all of our expectations and more! Located in the elegant Ilikai Hotel, it is so convenient for shopping, beach access and Waikiki nightlife. On a Friday evening, the day after we arrived, we had a 90th birthday celebration for my mom. The living room and lanai seating and kitchen bar were perfect for entertaining our guest. As we were enjoying the evening and my mom was seated on the lanai, suddenly a wonderful fireworks display began right in front of us. We had the best seats in the house and it certainly made our birthday celebration special! I look forward to returning to this condo on my next trip to Waikiki. Amazing view of Waikiki beach from the 15th floor lanai of Ilikai 1511. Very tasteful and refurbished lobby area with a general store, coffee shop, restaurant and other amenities. The condo is nicely decorated and clean. 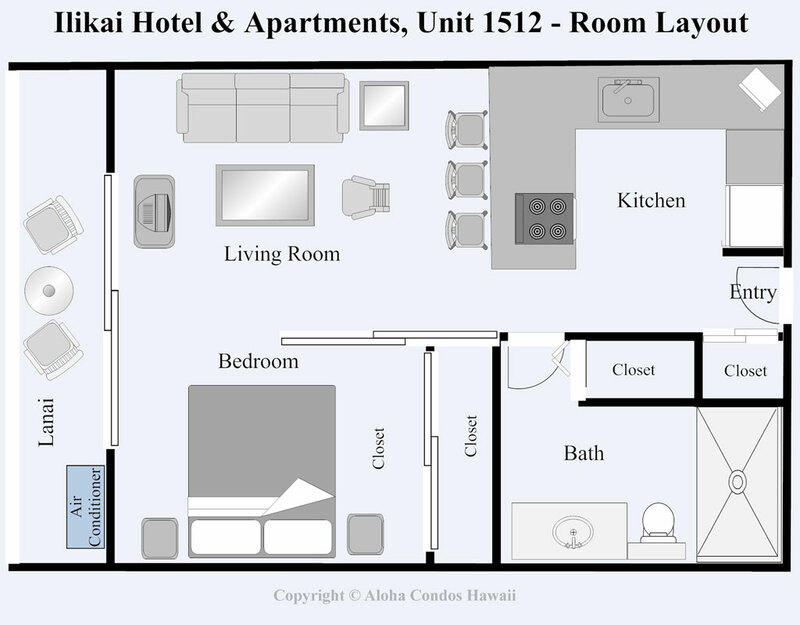 In my opinion, the condo is more of a large studio instead of a 1 bedroom because there is no wall or door to the bedroom, but it looks like all 1 bedrooms in the Ilikai are arranged like this. There is a shoji screen that does provide some privacy. There is also a sleeper sofa that can sleep one person comfortably. There is no dishwasher but good refrigerator and stove, and fully equipped kitchen. The laundry facilities are across the hall. The bathing elevator is directly next to the condo but we didn't notice any unusual noise. Perfect space for 2 or 3 people, but tight for 4 unless the sofa bed is changed. Only annoying thing was the wall air conditioning unit that blows directly onto the bed. We had to divert the air because it felt like sleeping in a wind tunnel. The owner and management are very responsive. Loved staying here! The condo was beautiful, the view is even better in real life than in the pictures. The condo was more than fully equipped with everything you need in the condo and for the beach. They even had boogie boards, beach mats, beach towels, beach chairs, snorkle gear etc. Making reservations with Eleanor was a pleasure. She answered my emails and many questions in a very friendly and timely manner. Great condo with amazing view of the lagoon and the ocean. This place was clean, well equipped and modern looking. The owner and property manager were both very helpful and pleasant to deal with. You will not find a better property at a better price this close to the beach with such a stellar view. Perfect, view was great, lanai was private, lots of water toys to enjoy. Condo was nicely furnished and had all the comforts of home. Could use more towels for showers. On the fifteen floor, we most enjoyed the beautiful view from the lanai where we ate many meals, read and talked. The kitchen was well equipped; the bed very fine, and good seating. We appreciated all the equipment from beach mats and chairs, to bogie boards and some snorkeling equipment. Also some toys for youngsters were available.The location was ideal. We walked to the ala Moana shopping center or Waikiki with ease. City buses left close to the entrance and we used them for excursions such as to Pearl Harbor. We would highly recommend this condo. No complaints at all. Great view, clean, comfortable and good location. My husband, son and I stayed for 5 nights. My 22 yr old son slept on the leather futon bed and was quite comfortable. Even though the check in time was 3pm, we got to the condo at 1:30pm and was able to get in with no problem. I love the fact that no key or card is needed to open the door. So, one less item to worry about. The Pink Trolley which stops right in front of the hotel took us all around Waikiki for $2 per person one way to shopping centers and restaurants. We enjoyed taking walks around the lagoon which we can see from the balcony. We appreciate the many different options for meals at the Ilikai, Hilton and Modern hotels next door and within walking distance around the neighborhood.Suggestion for minor improvement: Get a new hair dryer, have liquid soap at the bathroom sink and shower, a sponge and dish detergent for kitchen. Make it clear that this is a Studio, not a one bedroom condo. Somehow, I got the impression that it was a one bedroom with a door. Completed our first stay in 1512 april 2012 and had a wonderful time. The unit had everything we needed and more - beach towels, boogy boards, beach chairs and toys were definitely a nice touch! The view and lccation were both fantastic especially for the Friday fireworks from the Hilton lagoon. Leaving the unit for outings was easy and a nice touch was the combination door entry system so fumbling and searching for keys was eliminated. All amenities are close by within walking distance; restaurants, grocery store, beach, car rental and bus stops. Was a easy decision to add this to our annual accommodation in Waikiki! We have just returned from a week long stay at The Ilikai condo #1512. My husband and I travelled with our 2 children aged 17 & 11, so I was a little worried about having enough space in a 1 bedroom condo. However this place was perfect for us. It's in a great location with an easy walk to both the ala Moana Mall and the busy Waikiki hotel/restaurant district. We got coffee each morning from the cafe downstairs and sat on the balcony looking at the fabulous view. I really liked how there were beach chairs etc for guest of the condo to use. I would recommend this condo to anyone, I think it's great value and the owner was extremely easy to deal with. The only negative thing about our stay was the lady who 'ran' the pool each morning. She was consistently rude to people, however not the condo owners fault, but someone needs to have a word with her! We simply walked the 2 mins to the lagoon and swam there instead. I would stay here again if I return to Oahu. We had a great experience with 1512. Everything was just as listed/expected. A great part of Honolulu to say, everything is easy to get to. A bit noisy on the balcony (Ilikai Hvac unit & the Hilton's waterfalls), but the view makes the balcony great. The process to renting was smooth and easy. The favorite part was the easy walk to the beach! Perfect location, view, amenities and service. Even though we stayed in a privately owned condo, the staff at the Ilikai, including the Elite valet staff could not have been more helpful and courteous. The accommodations were perfect for the two of us and the view was perfect. It was within walking distance to ala Moana Shopping Center to the North and the zoo and parks to the South, with every imaginable shop & restaurant in between. I have stayed at quite a few places in Honolulu and the Ilikai was one of the nicer ones. Great amenities, felt like home, enjoyed the access to activities, beach, shopping. This was one of the best holidays ever, and we will certainly be back. The unit was ideal for us, and the view perfect. Thank you for allowing us this opportunity. Dont be fooled by the aged exterior to this building. The interior of Condo 1512 was brilliant and we couldnt have asked for more. Perfect view, great location to beach, Ala Moana and rest of Waikiki. A credit to the owners on the quality of the Condo. Great time had and have already started recommending it to others!!! We loved the condo! It was perfect. The view was gorgeous. We look forward to our next visit to Hawaii and staying at the condo once again. What an amazing Texas size value in paradise! Relaxing the moment we stepped into the condo and saw the view! For a limited space we fit in quite well. Anything that you needed was there and more. All the toys for the beach, Blender for smoothies, and all the channels for the Sports(hockey play offs). We would love to rent that suit again next year! The only downer is all the rules for the pool no toys,no jumping, no splashing pool just floating. I and my wife were looking for a nice, quiet and clean accommodation near beach in Honolulu and this vacation rental condo was an ideal place for us to be. The condo of beachfront hotel features wireless internet, TV/VCR and cable TV, well stocked kitchen, balcony with the wonderful view, comfortable king size bed. We greatly enjoyed our stay and would rent it again. Great Place! I would reserve again. This was our first time in Hawaii and we did not want to deal with overpriced hotels. We found this great condo unit, seconds away from beautiful Waikiki beach, public transportation and tourist locations. The best thing about this place was that gorgeous kitchen. We saved a ton cooking our own meals and spending that food money on our vacation! I would definitely reserve this unit again. When I was searching for a place to stay last month, I knew I wanted a one bedroom condo with a real refrigerator and a real door to the bedroom. As I was looking at the website I made my decision based on the furnishings of each unit, as if I were going to buy the place! Some had ugly furniture and non-updated kitchens. This place was great and had new appliances, a full size fridge, granite countertops and a breakfast bar. The bathroom was updated - large shower stall, but no tub, low profile toilet, and a single sink vanity. Minimal counterspace, but was able to use the linen closet for my toiletries. Fantastic view of the lagoon and we were able to watch the Hilton's nightly Luau from the lanai. A leather sofa sleeper in the living room, along with two chairs. The sliding shoji screens separating the sleeping area from the living area didn't go all the way to the ceiling, but they served their purpose. Had to make a trip to Don Quijote to purchase full size bar of soap and additional toilet paper; a box of Kleenex would have been nice. A little strange to dump your own garbage and no daily housekeeping service. I would definitely stay in this unit again. We were extremely happy.This was our first trip to Oahu.My wife and I were on our honeymoon. The view was amazing and because of this we probably ate on the balcony more than we did at restaurants. It was very clean and nice. The bed was comfy and again the view! This Condo#1512 is excellent. The view is beautiful,The location is perfect to go to the beach and the shop,becides,very quiet !Our little boy said " I wont to live this Room!!! "Next time, we'll stay this Condo#1512.Thank you very much. Great place! Great location! Great experience! We most appreciated the convenience of a condo combined with the support services of a hotel. The concierge desk was outstanding in helping us plan activities. Will not hesitate to go back or recommend it to friends and family. The condo was great - clean, beautifully decorated, plenty of supplies. Comfy bed, wonderful view of the lagoon and beach. We got to sit on the balcony and watch the fireworks from the Hilton. And our 2 year old even slept through them with the door closed! Best view of fireworks I've ever had. Easy access to the store across the street for simple groceries - we did a lot of lunches and quick dinners in our room since we had a 2 and 6 year old with us. Breakfast buffet was perfect for filling our bellies before heading out for the pool/beach.Easy check in and check out and we had no problems with the condo while we were staying there. Overall, it was a great experience. Our only challenges came from traveling with a very spirited 2 year old boy. The Ilikai is a great place to stay in Waikiki, very quiet. A few steps to the beach, restaurants & shopping, Ala Moana Shopping Centre is only 3 blocks away. Buses & trolleys are at your front door & there is a great concierge in the hotel for tour bookings. Unit 1512 had everything we wanted. The good thing was we had a choice of eating in or dining out. The laundry was very handy across the corridor. The fireworks on Friday night were special from the balcony as was the laui from the Hilton every other night. We booked an extra night after our original booking without any problems. Thanks for a very comfortable stay. I will have no hesitation in recommending this condo to all my friends & family. The condo was as nice and in order as described, nice furniture and upgrades. Very good ocean view. I enjoyed my stay. Every morning went down to the beach for a walk (there's a boardwalk along the way. )Location of the Ilikai is great, right on the city bus line, plus stores are across the street and the Aloha Shopping Center is within walking distance. Parks nearby, too. Hotel lobby was in good condition. Five elevators and no problems.The only drawback is the unit is located near the elevators and the mechanical room. If you are noise sensitive, that could be an issue. The fan speeds drop way down later in the night and then everything becomes very quiet. I slept with the lanai door open and that helped with other "white noise" and all went well after that. Since you're on the 15th floor, it should be safe to leave the lanai door open until it gets more quiet. (My brother and sister-in-law stayed in another unit and stopped by. They are not noise sensitive and could not hear the fans! )Otherwise, the unit was wonderful and it was very convenient to be close to the elevators and laundry room in the hotel. Very private, too. Our stay in 1512 in the Ilikai was very pleasant. The view was nice and it was very comfortable.The $125. per night seemed reasonable as well. The problem I have is the $125. charged for a cleaning fee. If you divide the $125. by the three days stay, the cost of the room comes to $165. + the taxes added to the $125. all comes to around $180. per night. We barely left dust during our stay to warrant such a charge. There are many hotels that we could have stayed in for the same amount that offer daily cleaning and are situated much closer to the action of Waikiki. Stayed for 10 days in unit and especially enjoyed the view of the Hilton Lagoon and the ocean. Arrangements to stay in this unit went smoothly and the unit was comfortable. Like the location which is close to the action of Waikiki but far enough removed to not be hectic. Unit is pretty nice though some of the furniture and walls are starting to show some wear and tear. Kitchen was well supplied and worked well for our needs. Had a short but very nice stay in this unit. We would stay there again as it has a beautiful view.. Telling everyone about condo unit 1512 is like telling everybody about your favorite fishing spot - something you'd rather keep a secret but it's too good not to spread the word!! The condo was better than we expected and better than advertised. The view was spectacular, the unit immaculate and handy to laundry facilities, garbage disposal and elevators. Lots of storage and many conveniences in the kitchen i.e. blender, microwave, corkscrew etc etc. It's a mild exercise to walk to the beach and the main tourist areas, however that neck of the woods is a little quieter and has the Outback Steakhouse and Red Lobster close by and the Ala Moana Shopping Centre is only a 10 minute walk. Other reviews we have read on this unit have referred to a noisy fan behind the kitchen wall; we found this a non-issue as some 'white' noise is relaxing and probably helped us sleep! Unfortunately we must recommend this condo (but please don't everybody book it up solid for the future - we want to go back!) !!! Thank you Eleanor...it was a dream holiday! We just completed a three week stay in unit 1512. It met all our expectations. Convenient for our needs, great views, clean and affordable. We would recommend this unit, and would certainly stay there again ourselves. Everything was fine except that we arrived, very tired, from St. Louis at 3.20pm and there was no key in the lock box. I had to call and wait for your local representative to come with a key to let us in. First time Condo Stayer! Loved it! We had a great time in Hawaii! The condo was in a great location and perfect for the 2 of us. The Condo is in a great location with spectacular views. Unfortunately there is a major noise problem. The Condo is situated next to a room where an exhaust unit, which runs 24/7 has been installed. This unit has been installed near the opposite side of the kitchen/living room wall of the Condo and you can feel the vibration of the motor through the wall. At night the noise is louder and it is very difficult to sleep.We have just had our fifth trip to Honolulu and we thought we had finally found our dream place to stay - a well-appointed Condo in a great location with spectacular views. You can imagine how disappointed we are that we will have to look elsewhere if we return.I hope this noise problem can be rectified so people can enjoy the Condo and more importantly recommend this Condo to their friends. This unit was perfect for us. We were at walking distance from the Waikiki main street stores, restaurants and nightclub. The view on the beach just in front of the condo is awesome. The unit was very clean, well maintained. Nothing wrong to say about this place. This was a very nice condo ~ more worn (privacy screen was in need of repair, but we did not use it)than we expected but in very good shape overall. The view from the deck is splendid. There was plenty of bedding available, as well as beach towels. Having an internet connection was a very nice perk. The smoke alarm battery died & the unit would not shut off even when battery was removed (electric) and the owner's people were very good about coming to replace the battery - actually we replaced it to "shut it up" and we were reimbursed for this expense. There is no dishwasher, but we ate out or at our daughter's larger condo so this was not an issue for us. The livingroom area could use a ceiling fan. There was a sand chair in closet, a boogie board & a beach umbrella but they were all broken. All in all we had a very nice week in this condo, and I would recommend it. We were disappointed in the $120 cleaning fee, as other relatives were not charged or paid a lesser amount. Would check more closely on this cost next time. Condo 1512 was absolutely fantastic.The condo had many upgrades, a wonderful view & was just steps away from the surf.Our 2 year old daughter LOVED the pool, beach & did great in the condo. She especially loved watching the Hilton Luau from the lanai every night! It was such a nice perk! We felt very at home in your condo, and appreciate all the great amenities you had available. The boogie board was a big hit with our daughter! And the full kitchen was a big hit with me! Thanks for a wonderful stay & we can't wait to go back to the beautiful island of Oahu. Especially now that we know of such a wonderful place to stay! My family and I stayed here during a recent trip to Hawaii. We loved the location and the view from the lanai was beautiful. The room was within walking distance to the beach or the lagoon. It was also centrally located to anything that one may need. The room was fully stocked with everything needed for the stay; towels, beach towels, kitchen utensils, etc. There are also books and DVDs for down time. Our only complaint would be the parking. There is no "free" parking. There is free daily parking by the beach but its not overnight, hourly parking across the street (25 cents an hour)by the harbor or valet parking at the hotel for $25 a day. We opted for valet parking as the easiest and least stressful. Plus, with valet parking, you can pull right up and empty your trunk. The backside of the hotel offers only stairs. However, we would definetely stay again if we return to Hawaii. My husband and I stayed in Ilikai Unit 1512 for 3 nights while celebrating our 15 year anniversary. The condo was very comfortable and conveniently located. While it's not right in the mist of the action of Waikiki it's only a pleasant stroll away. The Ilikai is located on the far end of the beach near the Hilton Hawaiian Village for 1/3 or less of the price. The owner, Eleanor, even surprised us with a bottle of champagne as an anniversary gift! Highly recommend this unit! We rented the place on our last leg of our first trip to hawaii after staying in Maui. The first time we stepped into the door was heart stopping as the place exceeded our expectations. It was perfect for us as we required a kitchen which was in excellent condition with all utensils. We had beautiful weather with great views which made our stay feel like a dream. It looked so much better than the pictures especially the TV. We had no problems at all with anything, it was simple as the keys were in the door safe as per email everything was there, it was close to the beach, transport, trolleys and Ala Moana Shopping centre. I really recommend the place as we really did. The eleavators were slow and sometimes not working. This updated condo is always clean and has a great view of the ocean and Waikiki Beach. I completed my second stay there last month and can't wait to return. It is so close to the beach, restaurants, etc. I think I'll pass on the rental car next time. I stayed at Ilikai for a 8 days. It has a nice, spacious lobby area that opens to the back of the hotel and a small bar. Nice picture taking. The apartment was big enough for 3 adults with a king size bed and sofa bed. The kitchen had all required appliances available. Bathroom was a good size with shower, not a bathtub. There is balcony that looks over the back of the hotel facing the ocean. There is partial ocean view as the balcony also faces the back of another hotel. Location is ok - it's about 20 mins walk from Waikiki beach (which is quite long - Ilikai is on one end of Waikiki). It is 10 mins walk to Ala Moana, the main shopping complex. Easy to get to the bus stops at Ala Moana. Coffee places, convenience store and restaurants are all near Ilikai. I enjoyed the apartment, it's very comfortable for long term stay. It made me feel at home. My wife and I chose Ilikai Hotel 1512 during our stay in Waikiki and we can both say we are pretty picky when it comes to where we stay when traveling abroad. I have only good things to say about condo 1512 and made our stay more enjoyable! The room was really clean and the location was really good. We had no issues checking in and checking out. Lastly, the price could not be beat! I would definitely stay here again. We thoroughly enjoyed our stay in Condo1512 at the Ilikai. It was exactly as it looked on the web site (that's always a worry). It was clean, very conveniently located for us and had a gorgeous view of the ocean. Having the laundry room across the hall was great and also the closeness to both elevators (normal and bathing suit) was a plus! We would definitely recommend the condo to others. We did suggest that the owner put a fan in the bathroom (for elimination of steam, for noise filtering, etc. The Condo was just perfect for us! Mahalo and Aloha! We were in Oahu for our son's wedding. We could not have been happier with the condo. We had family visit us and had plenty of room to entertain and the view was amazing. The location was perfect! We would and have recomended this condo to friends and family. The week we spent here will always be a wonderful memory for us. We loved it!! We spent a week here, and it was good time.Our granddaughter found found a lot of toys in the room to play at the beach, and we enjoyed reliable and fast wireless internet connection.Kitchen had everything we needed. However there were some issues - when we arrived, internet and even phone services were disconnected,We spent some time to figure out what need to be plugged in into what. But finally everything worked fine. There also was a problem with bathroom drain at some point, but it was fixed quickly. We would recommend this property. This was our second stay in this condo. We love the view and the price allowed us to stay longer. We will return for our next Hawaiian vacation. I love the Ilikai for it's Views, location and history, but it's getting old. The condo is remodeled and very nice, but the building is in need of some major work. I was sorry to see that the condo owners and the developer who wanted to remodel the place couldn't aggree, so he pulled out. It's kinda like a ghost town in the shop areas down stairs. We were 3 females in an open floorplan bachalor suite - our opinion - more suitable for a couple or 2 persons only. Sofa bed uncomfortable to sleep on.This apartment is small but very clean. Nice furnishings, modern, bright - lovely view of the lagoon and Pacific Ocean from a balcony with a privacy shield. Fully equipped and clean kitchen - immaculate bathroom.We all would return.BUT REMEMBER: you are renting a condo that is located in an old hotel. All of the shops on the main floor were closed accept a small food store that was extremely overpriced. No restaurants/gift stores etc. You will not receive any assisance from Hotel Staff. Parking is extremely overpriced for condo rentors. You are not welcome at the pool. Yes you can use it but the other owners will not make you feel welcome.